The show started almost by the minute at the same time as the previous Paris show. The stage went red, we would get "Sympathy For The Devil". 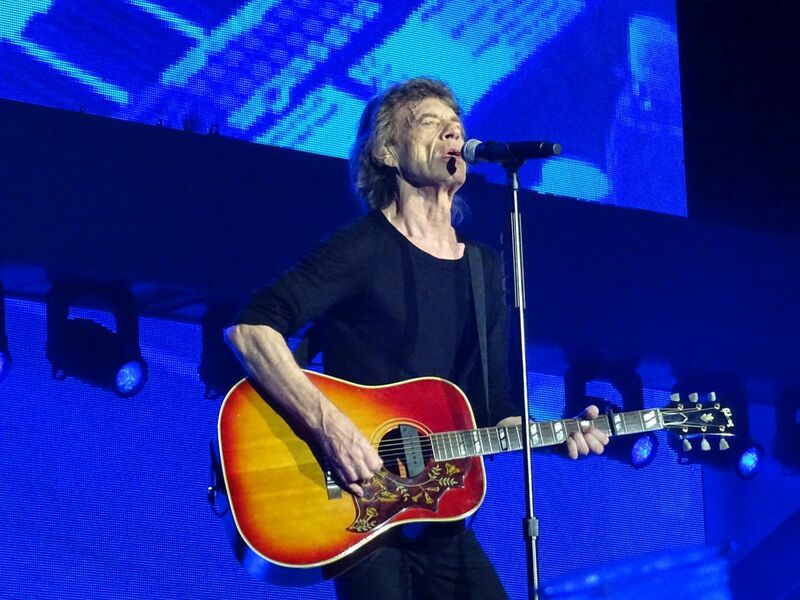 Mick was spinning around five times, rotating like a ballerina, then he went into singing "Sympathy For The Devil". The start was different versus Paris-2, but the next two songs were the same as for most parts of this tour. Also, "Just Your Fool" was back. 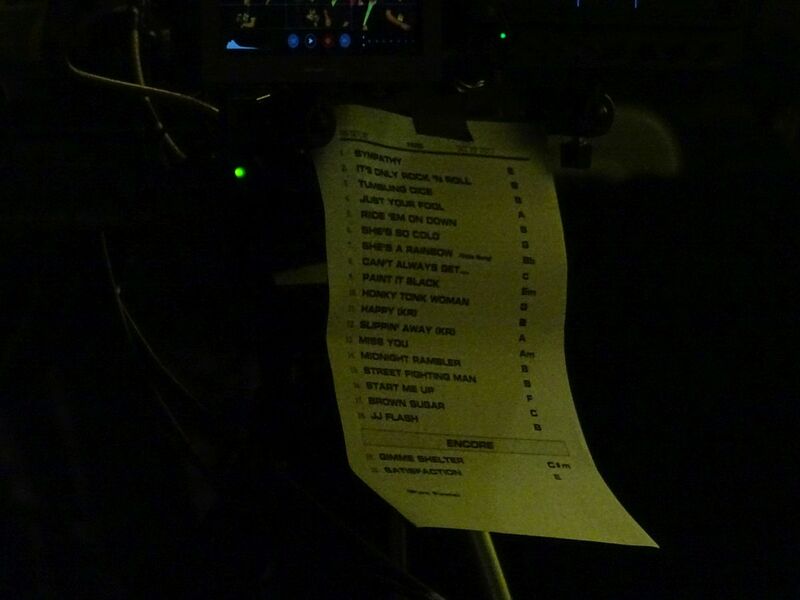 This was the set we were used to on this tour, the success set list all the way from Hamburg early September into Paris, by the end of October. "She's So Cold" may have been the best performance of that song, at least from my memory. 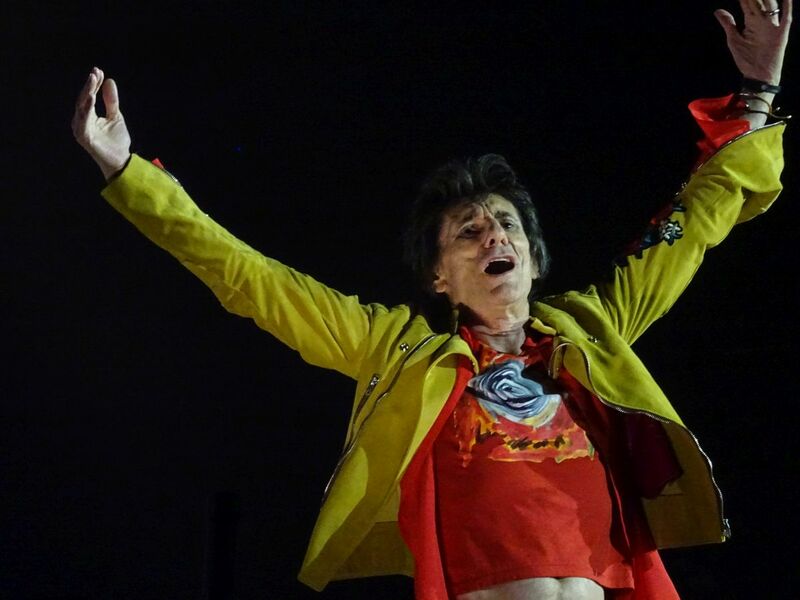 Mick had so much energy, he tried to speed up and run the band into a higher level of intensity by waving his hand like "come on guys, we can do more, stronger, better"... And next, we get "She's A Rainbow". Like Mick said, a very different song. 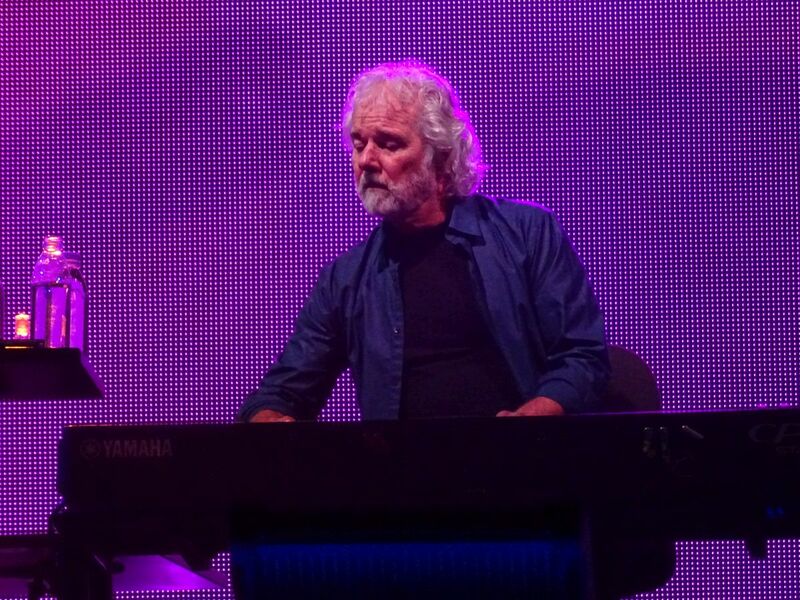 Chuck played the opening part with the well known piano intro, Ronnie on the slide, following Chuck close, Mick in the front with the acoustic guitar. The song worked perfect, and it could not have been a better song vote. 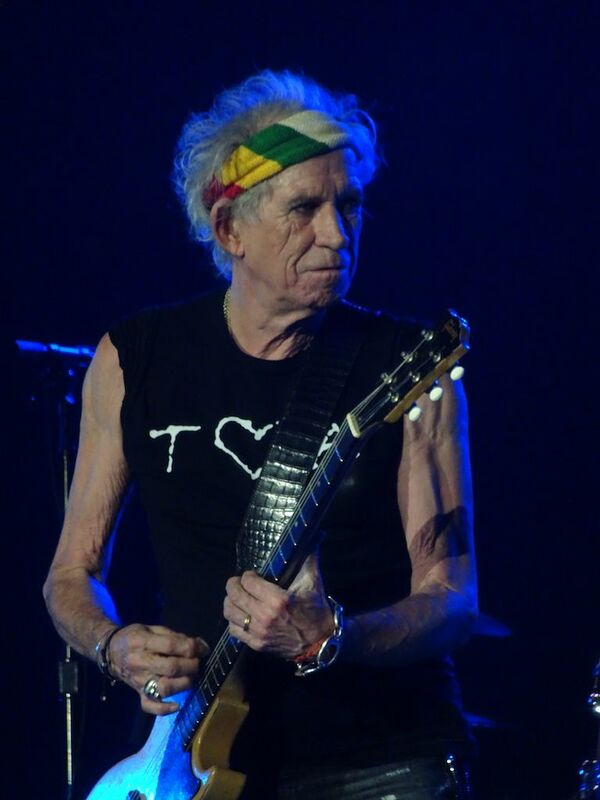 Keith started "Paint It Black". 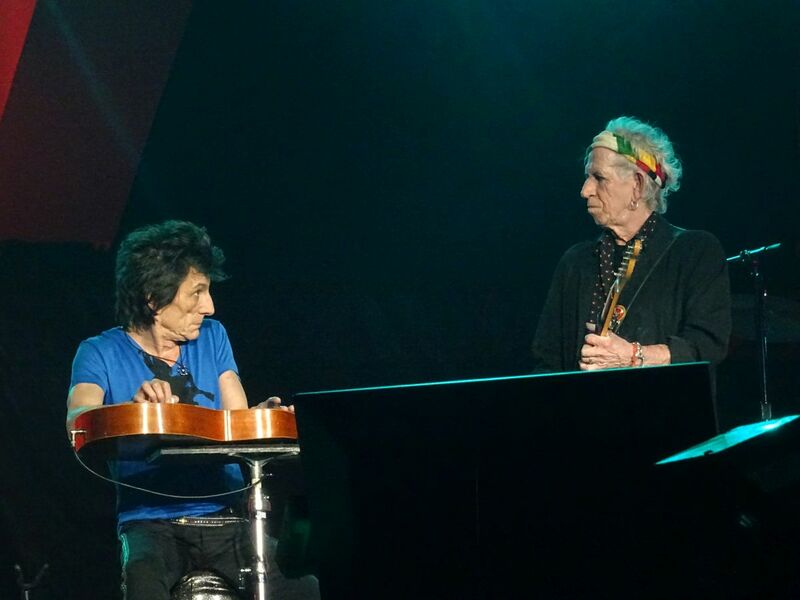 Mick was next to Keith, on Keith side, he is just about to start singing, when he realize he has no microphone. Just two or three seconds to go, he rush over half the stage, picking up the microphone, which he left next to Chuck, on his drinks etc table, just in time, then he start singing "Paint It Black". Great version, one of the best songs of the show tonight. Keith did his usual safe set, it works great every time. After "Happy", he said: "Last time for a while: Slipping Away". So when Keith is saying it, and Mick is saying it, then it is confirmed. There will be more shows to come. This band has not finished their business yet. 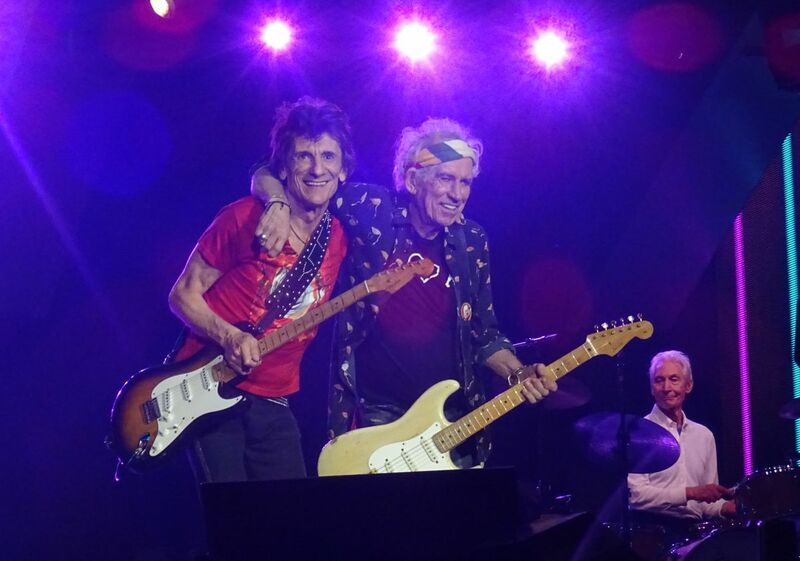 Those who like to see Mick and Keith close together on stage - I am not the only one - got a lot of it tonight. 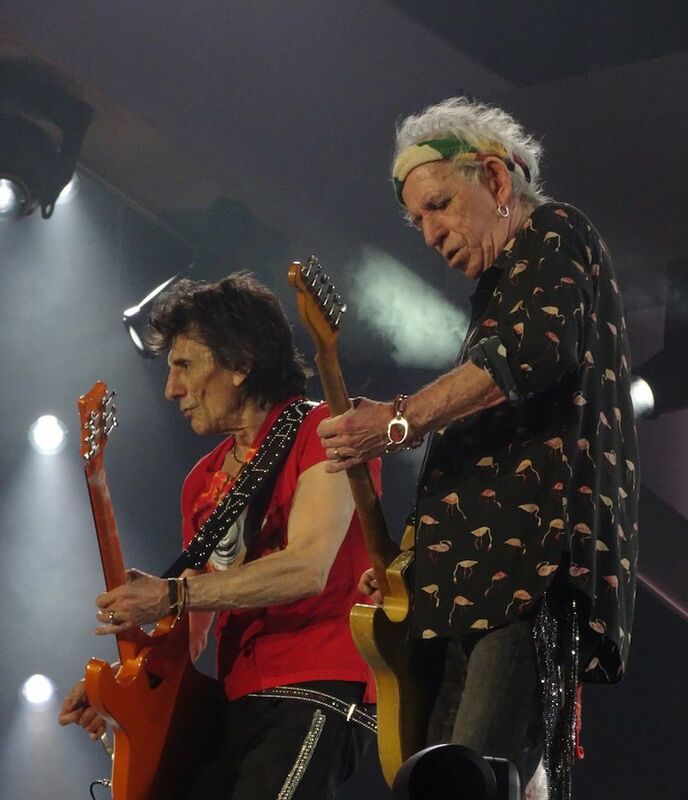 Mick & Keith had several moments where they shared the stage close, smiling, performing next to each others, including "Midnight Rambler" and "Street Fighting Man". By now there are all smiles, everybody is happy, on stage as well as in the crowd. I got what I came for - a great show. I would be happy with an ordinary show, but this show ranks with Paris-2 as one of the greatest shows of this tour. 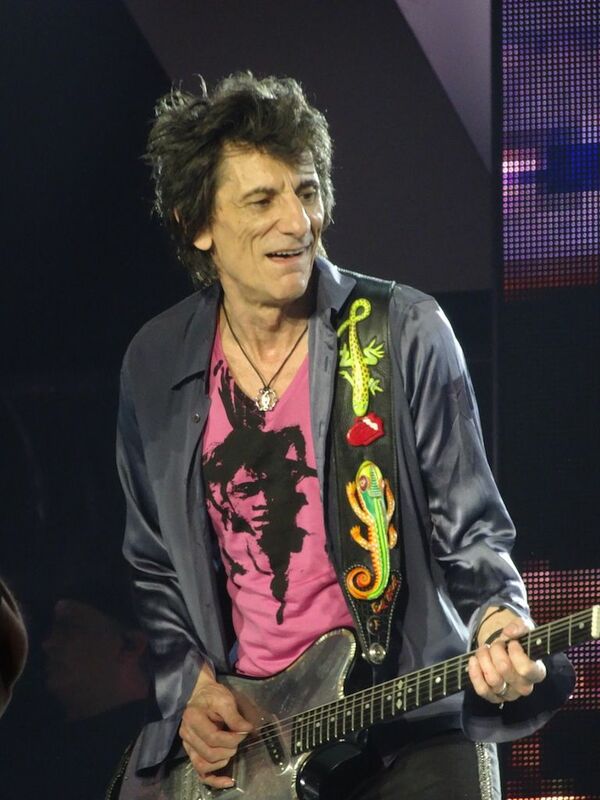 Staying eight days in Paris to see The Rolling Stones three times in the same city is a privilege, and a great memory. Also, meeting many of the French fans and friends I got to meet during the Paris rehearsals in 2012 and 2014 was great. The fans make the crowd, and friendships on this tour have been strong. I would like to thank everyone I met for all the great moments. See you again in Stonesland next year! "When you‘re old, nobody will know." 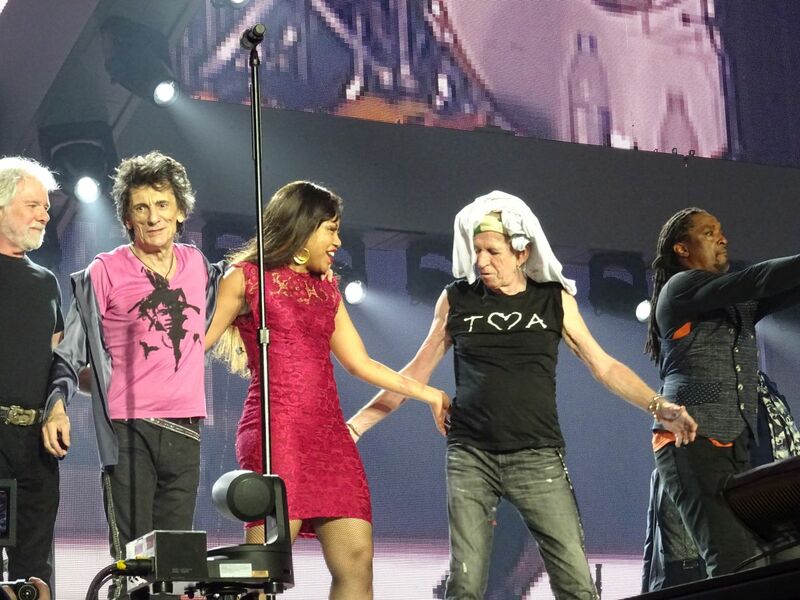 Keith wore a white shirt ON his head before the final bow. This shows what a fantastic and fun night it was. Many smiles on stage between the boys, laughter and joy. The final Paris show was brilliant. Keith was so relaxed and really in love with it all. 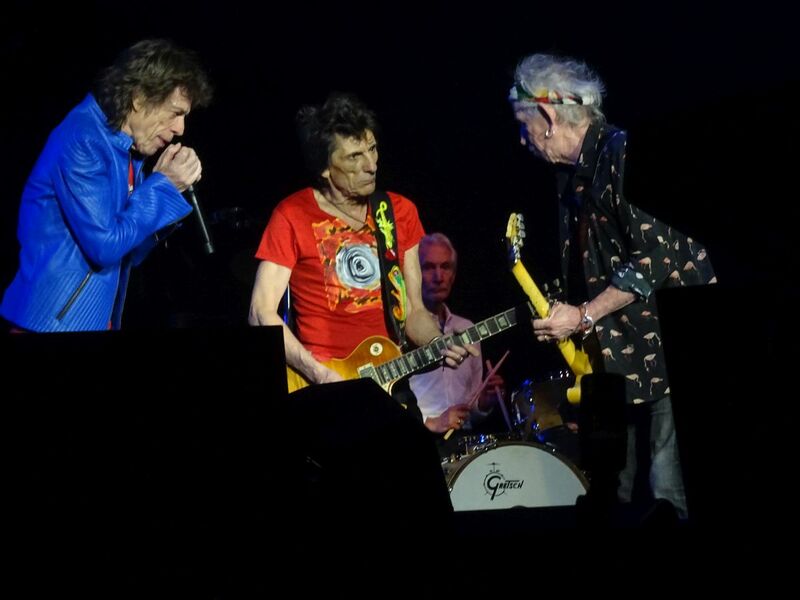 The Stones were very energetic and the audience felt that from minute one when Sympathy started. 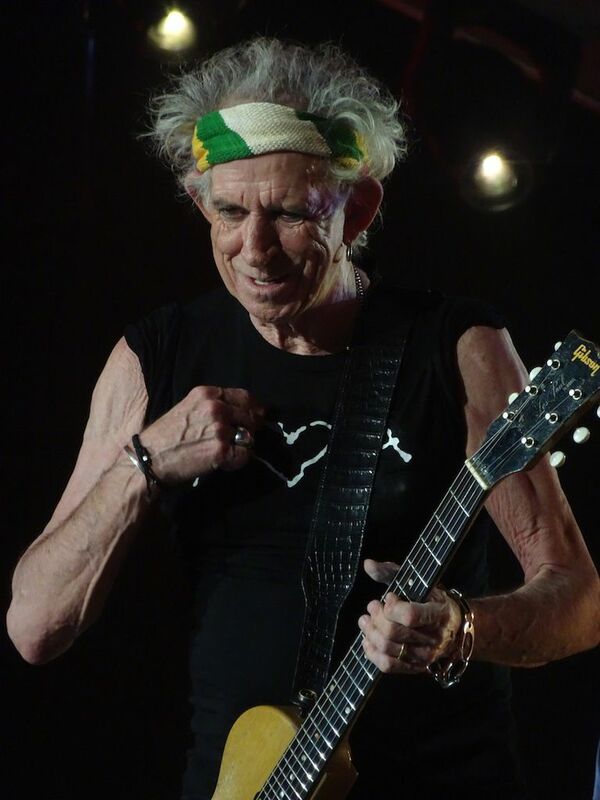 Highlights were Keith introducing Mick; that girl showing Mick her t*****s during Brown Sugar; definitely Midnight Rambler - a long, strong and playful version; Slipping Away - so gentle, my tour favorite; Ronnies loud solo on Start Me Up; Karls awesome solo on Brown Sugar and She‘s so cold - a rocking suprise. Tonight I also understood Keith. He is a blues man. When he play a riff and stops, it is just like a blues solo where you play a note, wait and then play another. It is all in the pause. Same with Keith. He was brilliant. And Charlie. Just wow! So well played. Thank you Rolling Stones. We love you.. Nothing much to say: THANK YOU BOYS, HOPE TO SEE YOU IN 2018 ! A marvellous final with a lot of energy, enthusiasm, and a real good playing from all the band. Even "she so cold" was a highlight tonight ! Tonight was the last show of the tour and definitely not the last show ever. 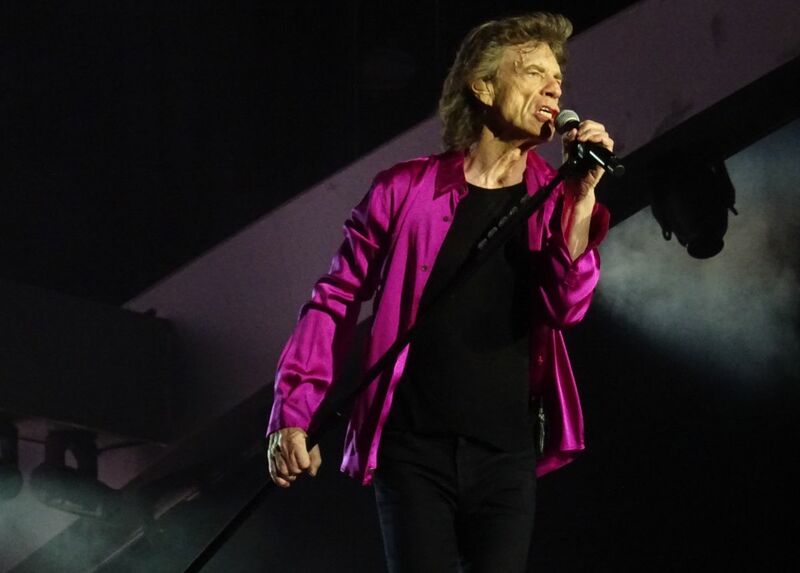 Mick even said that it was the last show “for now”. This time I wasn’t in the PIT because at the moment they sold the tickets a few months ago, everything was sold out. Actually, I was in Mexico at that moment and the last Paris show wasn’t planned. So when I went to sleep, no show was added, and at the moment I woke up, I discovered that a third show was already almost sold out. A nightmare for me. So I decided to buy the best package still available: FOSSE OR with early entry. 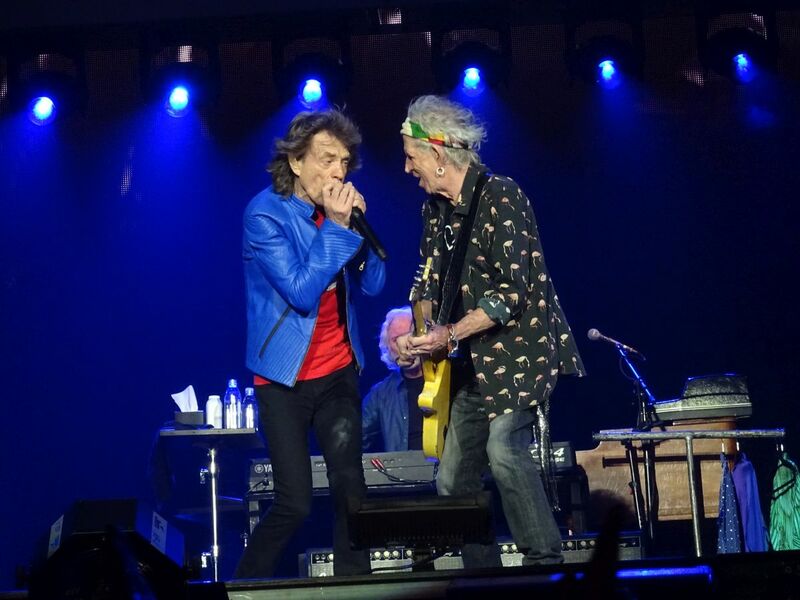 Tonight they started the show with Sympathy for the Devil, like Paris no.1 and they performed it amazing! 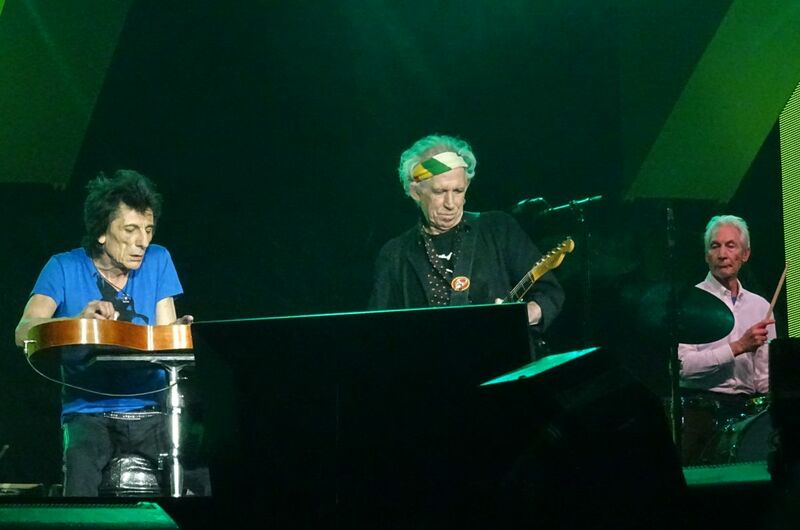 The sound was perfect and Keith was great, he was very concentrated. 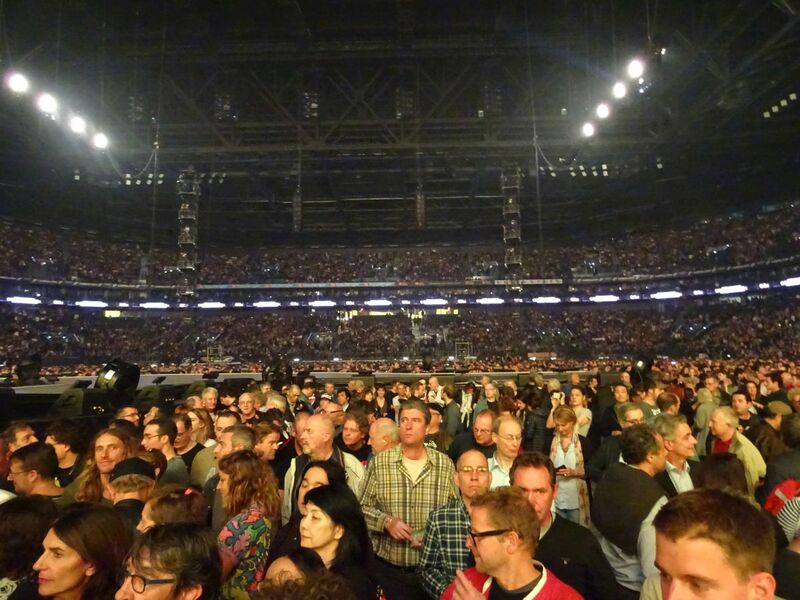 Very soon, I noticed that the show would be very different for the two first Paris shows. Less fun, but better music. I found the first part of the show, from Sympathy to HTW very strong and solid, the band is very focused on the music. She’s so Cold was an amazing version today. They did it in Paris in 2006 but I much preferred tonight’s version. She’s A Rainbow was very beautiful, I love having this kind of rare songs. It makes the show better! 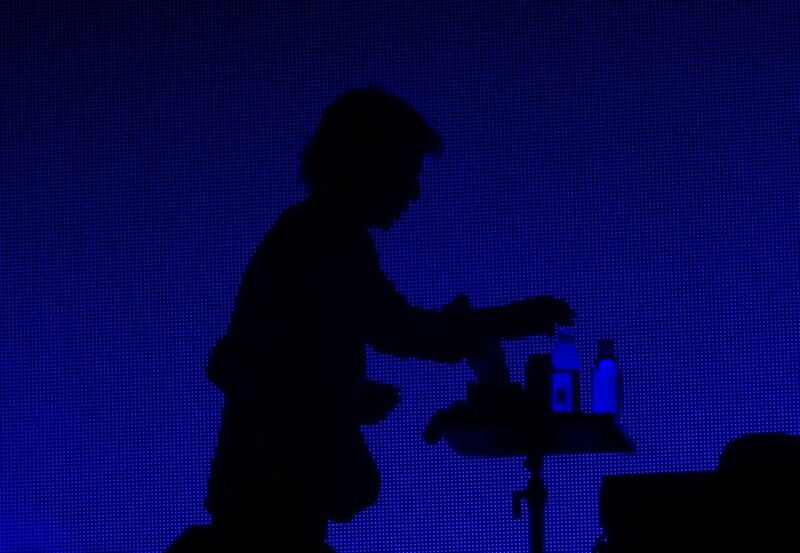 The start of Paint it Black was funny, Mick Jagger arrives to his tripod and noticed that he forgot his microphone near his little table (the one he uses to rest and drink water). So he ran like crazy to take it back. But it didn’t ruin the beginning of the song at all. The rest of the show was excellent, like the two first shows. Midnight Rambler was again fabulous and the highlight of the night. I didn’t like Sasha Allen. Lisa has much more charisma and voice than her. Emotionally, Paris No.1 was the best. 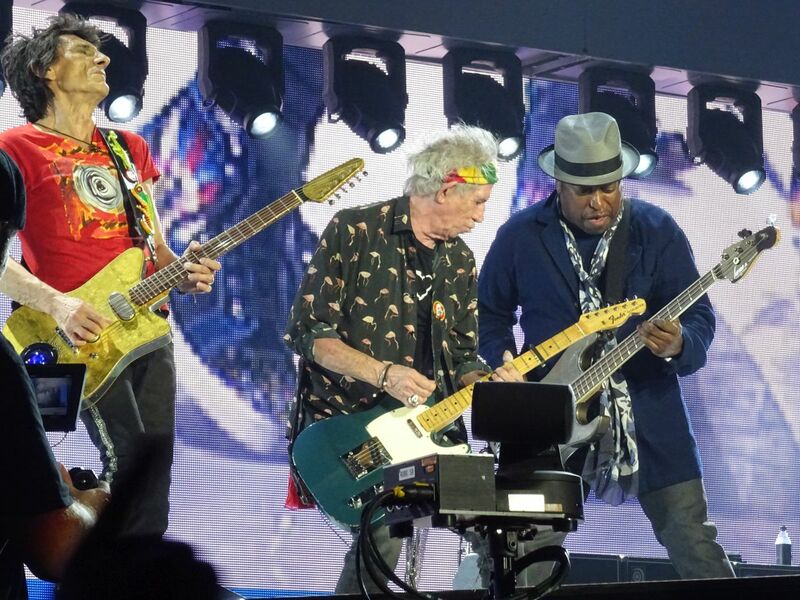 Paris No.2 was the show the Stones had the most fun. 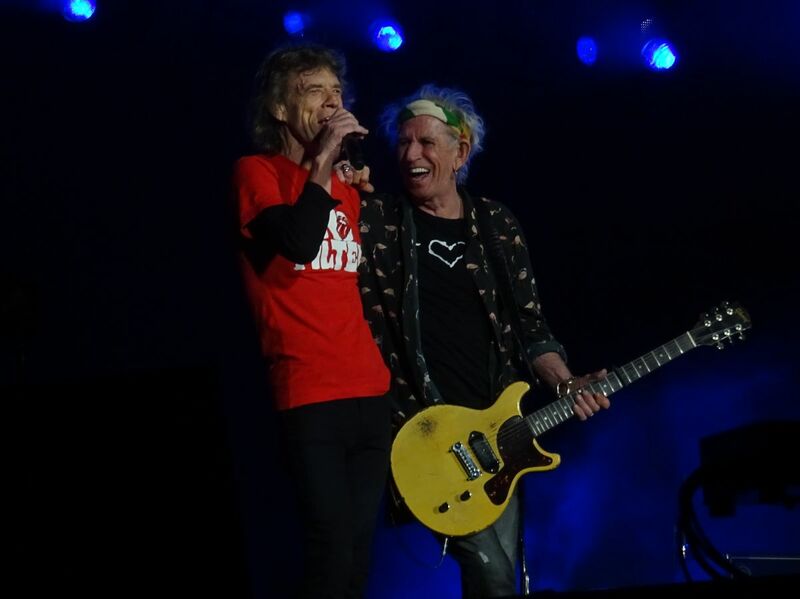 A lot of interactions between Mick and Keith, a lot of smiles, and a Mick Jagger like I have never seen him before. Paris No.3 was probably the strongest of all of them. 3 completely different shows that I’m glad I could see even if I spent too much money. I met so many nice people and I’m so happy I could see again many of my friends, from all over the world (Japan, Argentina, USA, Germany, France, Netherlands, Sweden, etc.). The Stones family is getting bigger and bigger. I see you in the next tour. 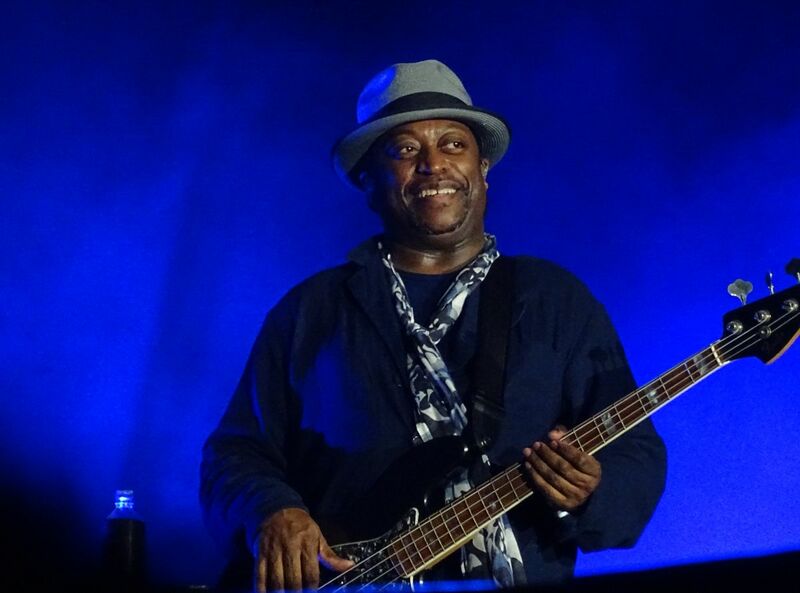 There are always mixed emotions about the final gig on a tour. Could this be the last one ever? Will the band play it safe on the set list? Have they had enough of each other’s proximity, and so be tense and stressed? If it’s an “extra, added-later” show, will there be many real fans? Will the band, and fans, be tired and worn-out? Did I really spend that much time, and money, on this tour? We started off back with Sympathy, and no “ladies and gentlemen, the Rolling Stones” from Matt C. But we also got She’s So Cold and, a first time live for me, She’s a Rainbow. She’s So Cold I’ve always liked for the guitar interplay. Keith started this like an express train, and it just got more and more intense. I think a better version in all senses, including the musicianship, than the first time I heard it in Wembley in 1982. 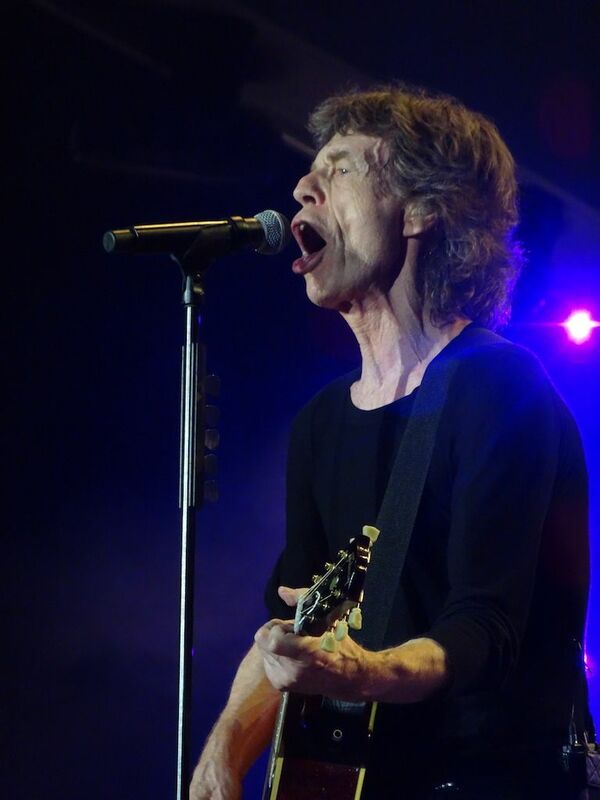 Mick was also very powerful in the vocals. She’s a Rainbow was brilliant to hear. The keyboards were very close to the studio version; Mick played acoustic; lots of gentle weaving on the electrics; delicate pauses before the start of each verse. One of the highlights for me and many around me. I’d now like to hear a couple more from Satanic Majesties, to add to this and 2000 Light Years. I’m not joking; obviously Gomper wouldn’t work, but Sing This All Together would for example, as would Citadel. Other highlights were Street Fighting Man, again, a much-improved Brown Sugar, and Rambler. How good can Rambler get? The looser sections of it, almost a jam, provide just a glimpse of the band member’s interactions – waiting for the lead into the next tempo, or riff, or vocal lines. 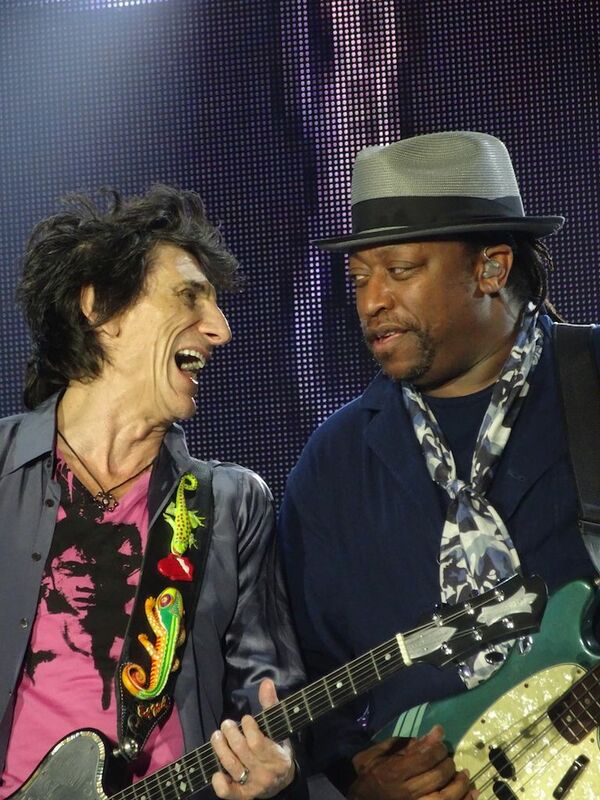 Plenty of short improvisation, and some fantastic riffs from Keith and lines from Ronnie. There is a bootleg from 1973 that has a very dischordant note in Rambler from Keith (Bedspring Symphony maybe? ); I was half expecting to hear that in Paris. So powerful. So enjoyable. Charlie’s drumming hammering like a machine, so powerful and regular, at one point. This has become the definitive blues-rock opera. 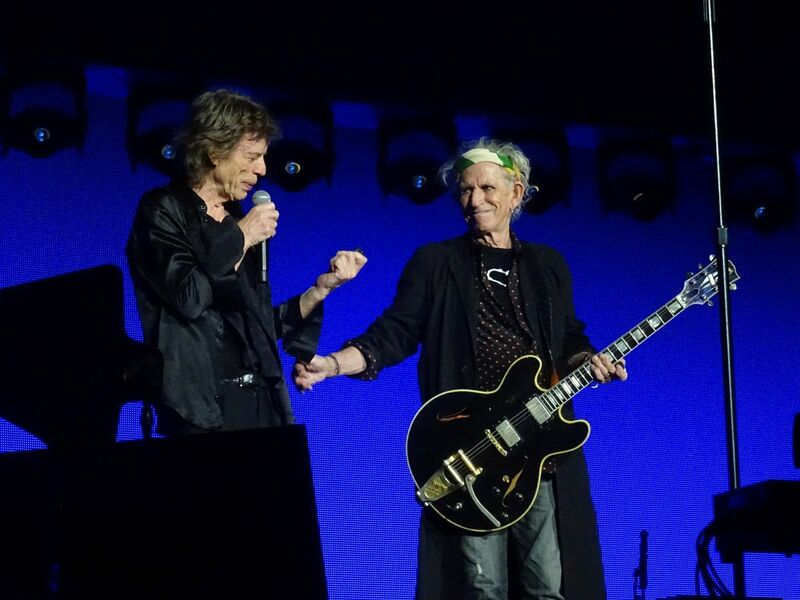 I’ve never heard Mick introduced on stage before; well Keith did it in Paris, to a big cheer. Keith himself gets a massive extended cheer, but no Ole Ole that I could hear, and Charlie’s cheer was not far behind. Mick asked him to show his socks and he complied. I couldn’t see them. Ronnie completes the band member cheer with his usual little dance, having been introduced as the Renoir of Rock. The whole band on stage should get a huge cheer for an excellent performance; in fact for many excellent performances this tour. There has been the odd rocky patch; lets face it everyone has an off day, or minute, at work. Like the middle Paris show, the on-stage camaraderie seemed genuine and was rather touching. I’m sure the band don’t want to live with each other all the time, but clearly two months’ work helps re-cement those very long relationships. 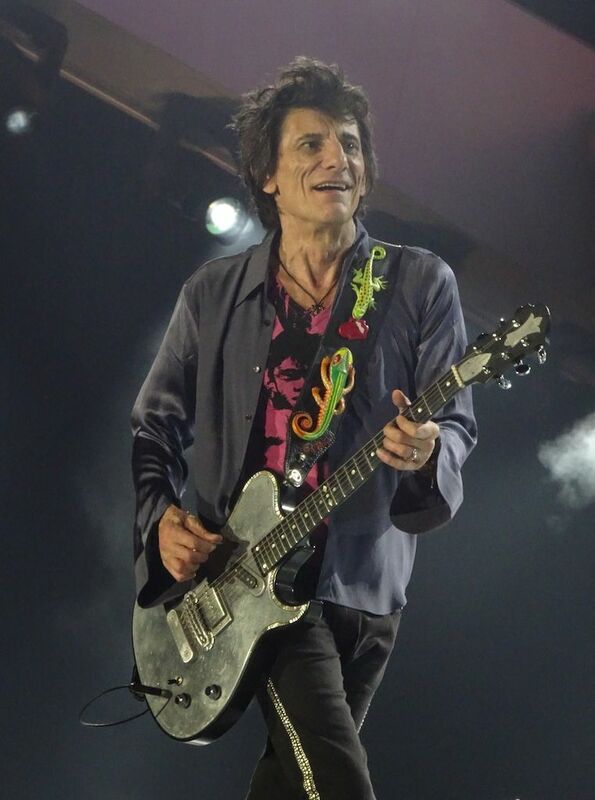 So there we have it, the 6th consecutive year of Stones gigs. They haven’t done that since the 62-67 stretch, and the new touring format of 14-18 gigs each year seems to work for them – it certainly works for the fans. I don’t think anyone would suggest a 100-gig year like they did even 10 years ago for all the obvious reasons. They played 17 songs on every show in Europe, some like Paint it Black and Street Fighting Man, really rejuvenated. I saw another 13 played: in total 5 off of Exile. I think they played another 6 at other gigs I didn’t see, and I wish I’d heard Play with Fire! We know they rehearsed another 9 from the song vote choices. I guess there were many more. Of course the discussion after this last Paris gig was all about this great gig (gigs for some of us lucky ones), and what about next year. 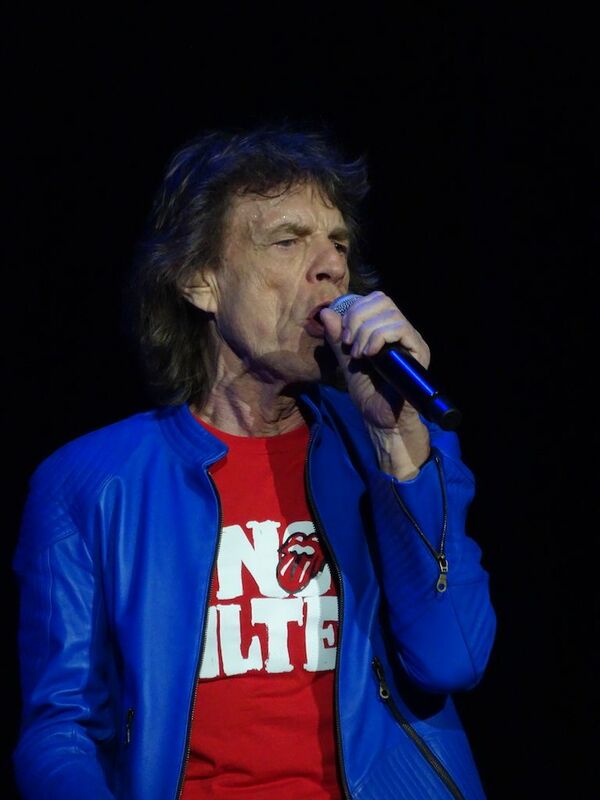 The Stones themselves said they plan to play in the UK. I’ve heard or read about places further afield as well. I guess we’ll just have to wait and see: for a tour (or two?) 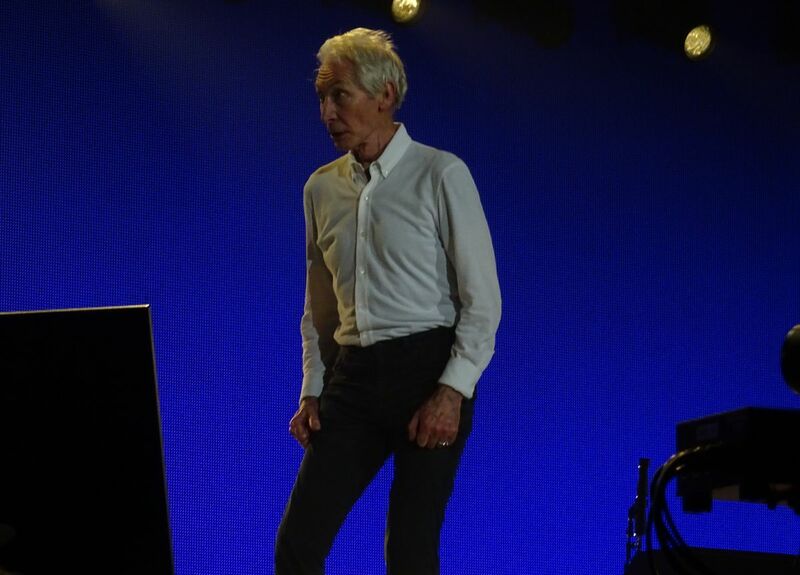 in ’18; for the long-worked-on studio album; for more of Mick and his merry band of strolling minstrels (or is it Charlie Watts and his fabulous Rolling Stones?). A few thanks seem in order. Obviously to the band themselves, but also to the supporting musicians without whom this would not work, and from me especially to Bernard, Tim and now Karl. Also to the whole crew who make this possible, from the security team, to the backline crew, from sound and light (both world class in my opinion) to office support, and all the others who make this possible. Next to our fellow fans, from all corners of the world (can a sphere have corners? 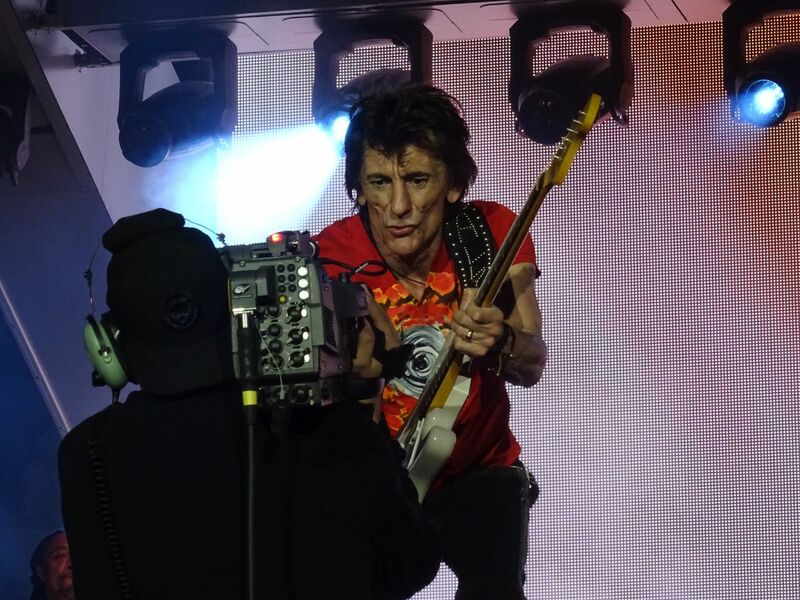 ), many now friends (some old, some new, some blue turning grey…), who make a Stones gig or tour a real social event and complement the pleasure of the performance in such a delightful way. Finally to Bjornulf for this site and all the work it entails. This brand new 40,000 capacity arena in central Paris made a fitting setting for the three final gigs of the Stones No Filter European tour. 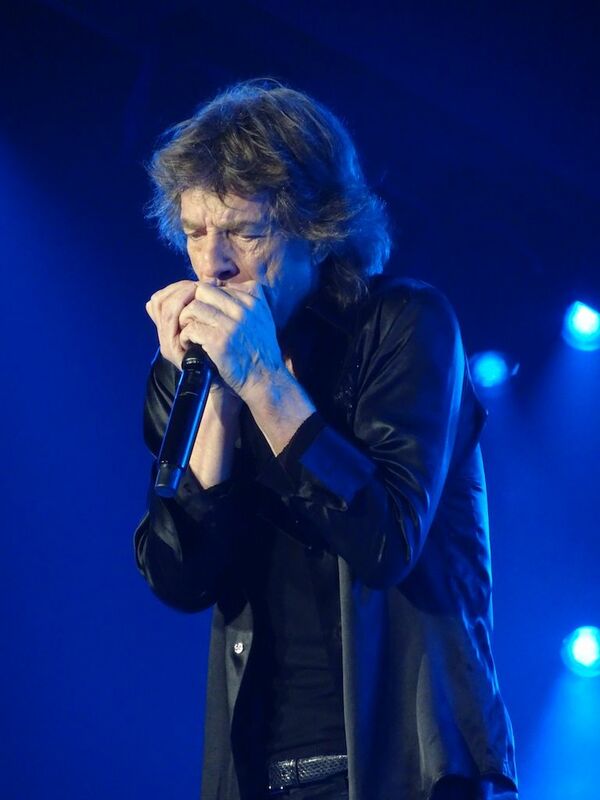 Sympathy For The Devil was an innovative opener and the two blues songs Just Your Fool and Ride’Em On Down provided an early opportunity for Mick Jagger to demonstrate his harmonica prowess. A faultless She’s A Rainbow - tonight’s web choice - belied its 50 years. 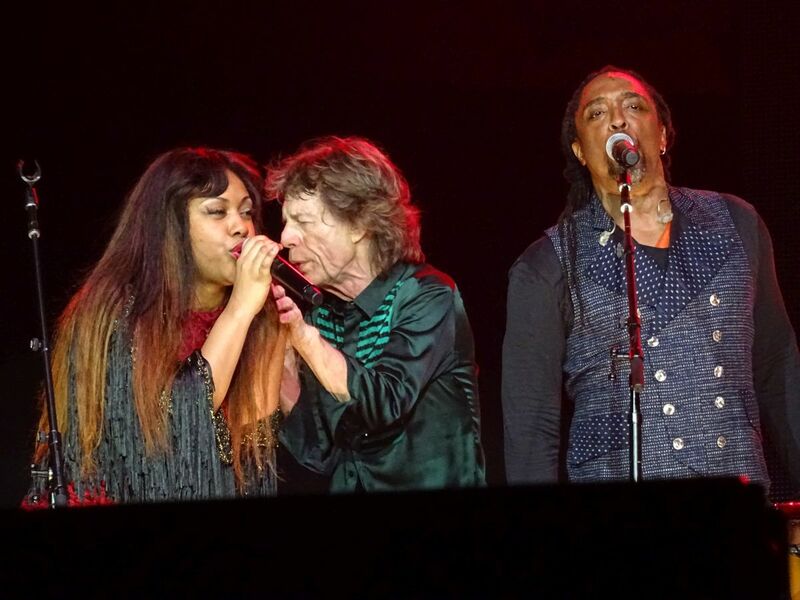 Encore Gimme Shelter was a showcase for Sasha Allen, her duet with Jagger featuring less vocal histrionics than was the case with latter-day Lisa Fischer. 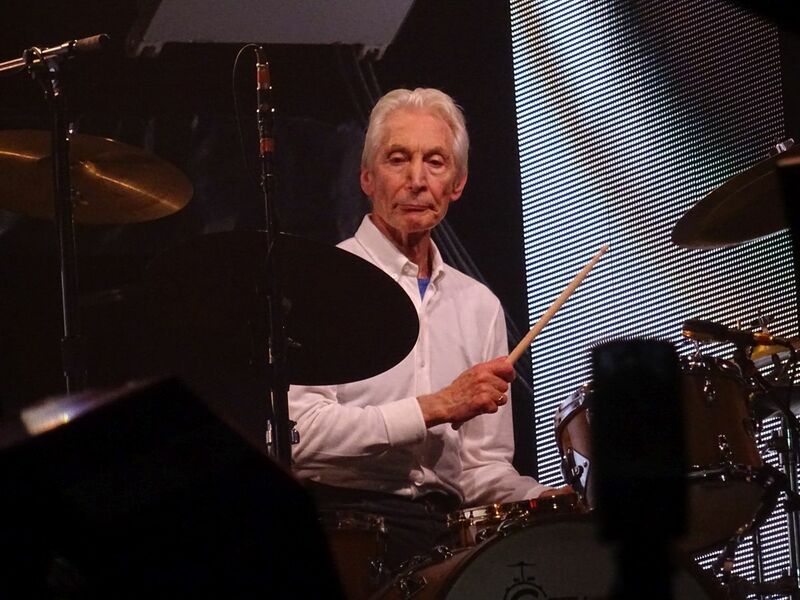 The powerhouse at the centre of tonight’s rousing performance was the ever-crisp Charlie Watts on drums and effervescent Ronnie Wood on guitars. 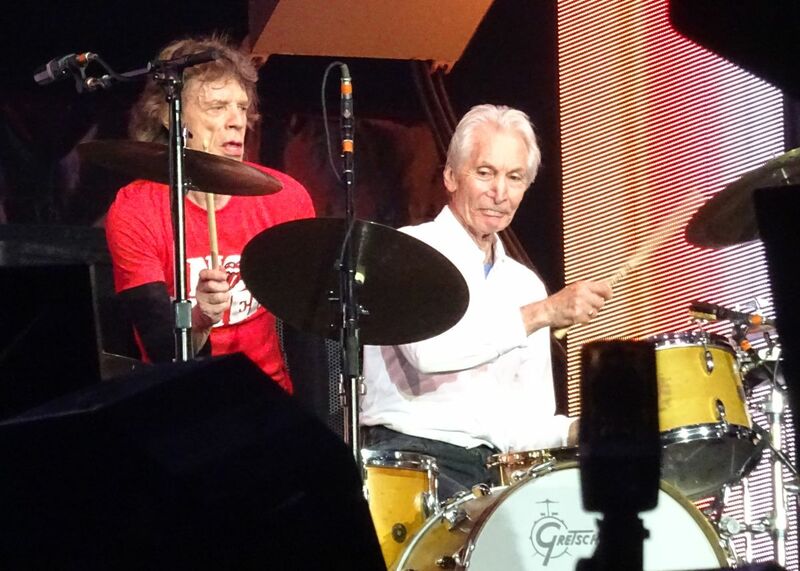 Jagger was in a mischievous mood, telling jokes about Theresa May and ending a stunning Street Fighting Man by playing Charlie’s cymbals. For my 5th stones show (1990, 2006, 2007, 2017 oct. 22nd were the four previous ones) I came with my 13-years-old son, for whom it was the first time. I was happy that he saw such a great gig. On Sunday Oct. 22nd, I was feeling enthusiastic : good vibrations all over the place, humour and love on stage and great playing - everything was great. Yesterday night, for the last show of the 2017 European Tour, I had the feeling it was even better. I guessed it would be a special night when I spotted Theodora Richards in the pit a few minutes before the first song. I thought our heroes were going to play their hearts out for their relatives and I wasn't wrong. First song was « Sympathy for the Devil » ; I wondered whether they would surprise us as they did last Sunday, opening with « Jumpin' Jack Flash ». I was happy to see them open with the red lights, the drums, piano and vocals. When Keith played his first solo, I was in heaven : he played it very well, hitting strong riffs, simple but straight from his guts to ours. He didn't make any bum note but gave us just plain blues phrases. So was his second solo, full of emotion and musically perfect. 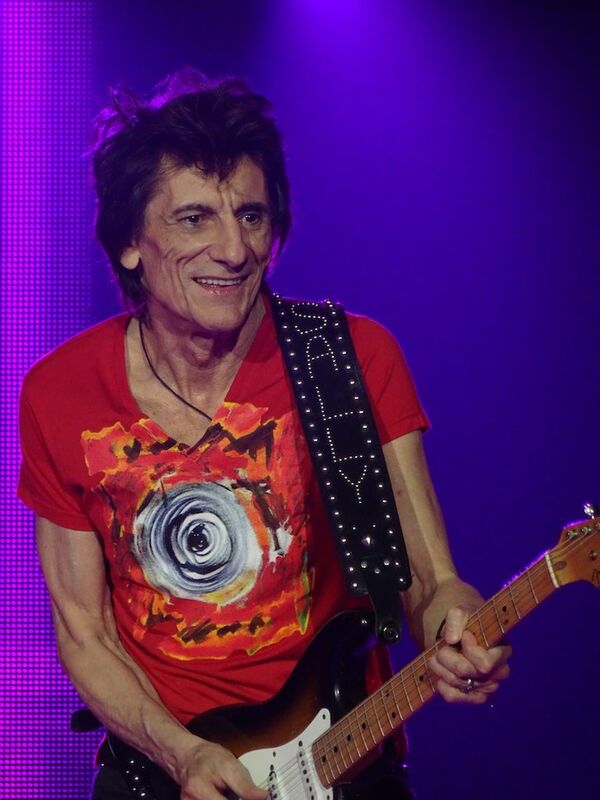 In my humble opinion, it doesn't make much sense to compare his nowadays soloing with the ones he played in the past. Who wants yesterday's paper ? Who wants yesterday's Keith ? I always loved the way Muddy Waters used to play his very simple but heartbreaking solos : Keith has had that magic for a long time and his guitar sound is so terrific that he doesn't need to go through virtuoso display. Next came « It's only Rock'n'roll ». On sunday, Keith had to restart it, which was fine with me. Yesterday night, it just came fluidly, easily, riffing hard and accurately. What a joy. Some of us had wondered if the boys would play a Chuck Berry tribute. There it was, in a Chuck Berry composition ironically signed by Jagger/Richards. No laziness tonight. And when Keith is on, we all know the whole band plays better. I won't go into much detail for each and every song but I didn't hear any major trainwreck nor any minor mistake. « She's so cold » was the best version I ever heard, live or on bootleg recordings. Very sharp, very energetic and Mick was very funny indeed. It all went down very strong. 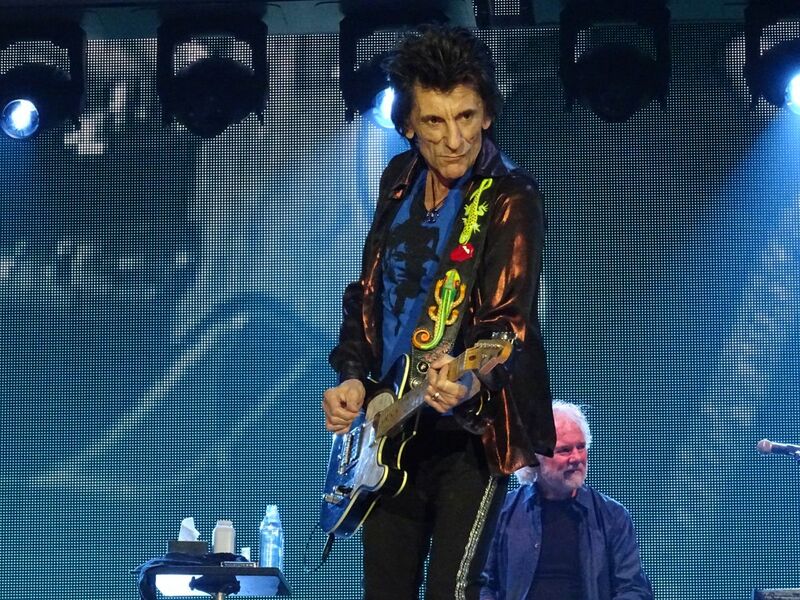 Ronnie played great solos, including « You can't always get what you want » and « Start me up ». Charlie's playing was so impressive and dynamic that I wondered if anybody can stay still and quiet whilst he plays his drums with so much swing and strength. Many fans are complaining about « Miss you » : they don't want to hear it anymore ; they feel it's boring and so on. I totally disagree - I just loved it . Especially the wonderful bass solo which Darryl delivered and the very jazzy yet effective sax solo by Tim Ries. Mick said a line or two with a very deep low voice at the end of it, which was amusing. « Midnight Rambler » seemed a little faster than Sunday, however, both tempos please me. Some of us heard little mistakes though I didn't. 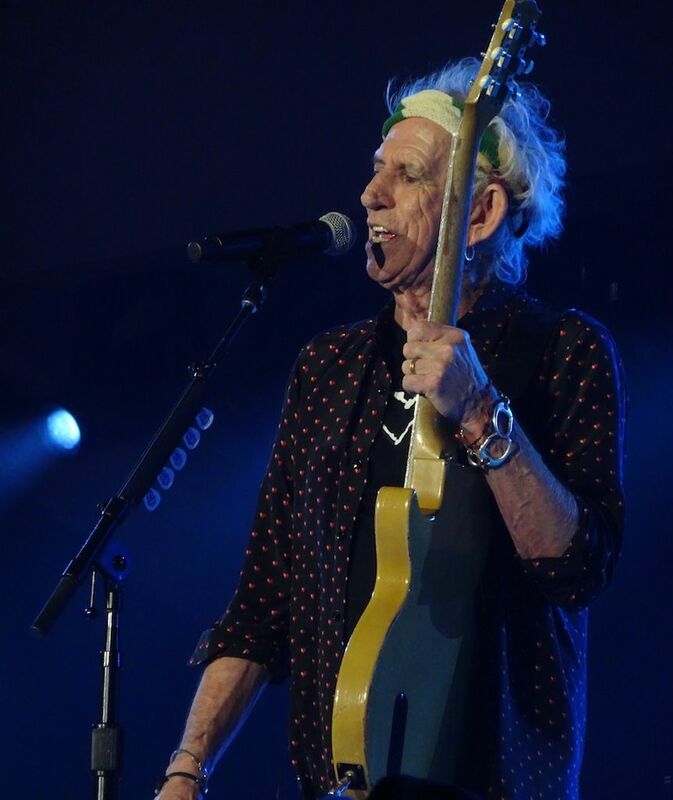 During « Start me up », there was a moment where I didn't see Keith anymore. I looked for him and found him sitting on Charlie's drum podium. Maybe he was a little tired, which is understandable considering he played 2 hours straight of high-energy rock'n'roll. Just hope he's alright. The crowd was full of nice people having a great time. I was in Fosse Or, Keith side, 3rd or 5th row from the front, next to a very nice guy who had come from NYC for that particular show. We had a small yet pleasant conversation at the end of the gig. All in all, it was the best concert I ever attended, and I was very pleased that my son was able to see and hear such a show : he heard many songs for the first time and he enjoyed them a lot. The show on Sunday Oct 22nd was funnier however, yesterday night's was musically sharper. Both were full of emotion. Thank you guys, for giving us such a treat ; full of emotion. See you the next time you come to France. May God bless you all. 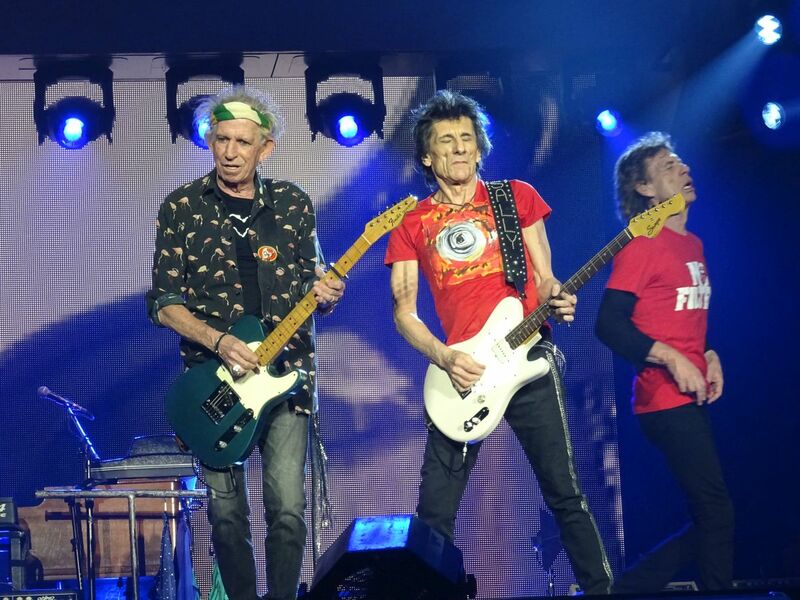 It's official: there'll be more Rolling Stones shows, according to Keith. It's also official: Paris #2 was easily the best of the shows in the City of Lights. Paris #3, by contrast, was a surprisingly perfunctory way to end the tour. 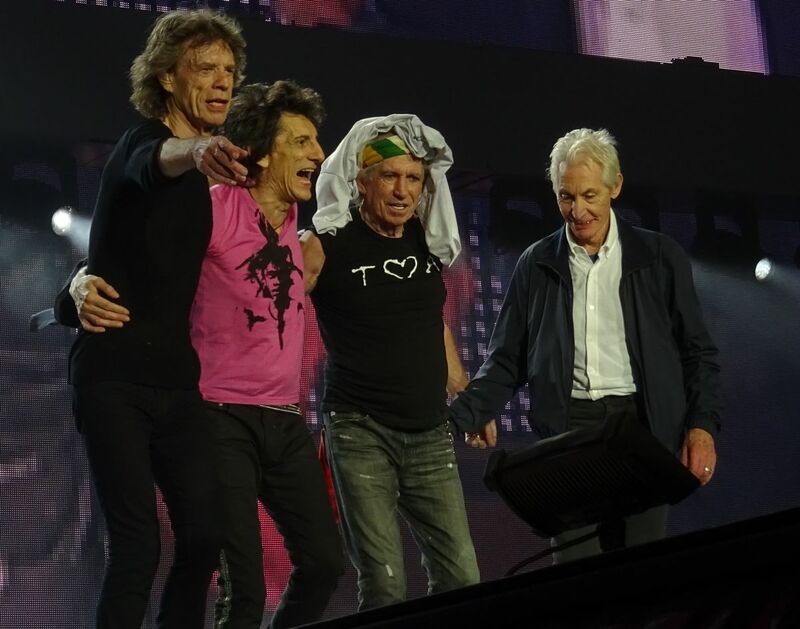 If you were in any doubt, you just had to watch Mick during the final bow. He quickly detached from his band mates and left the stage without a final wave or glance. There were evidently more interesting places he needed to be. Each of the guys seemed a little self-absorbed during the show, which was odd after the great bonhomie of Paris #2. Keith and "Le Renoir de Rock" probably spent more time with Darryl than making eyes with each other. 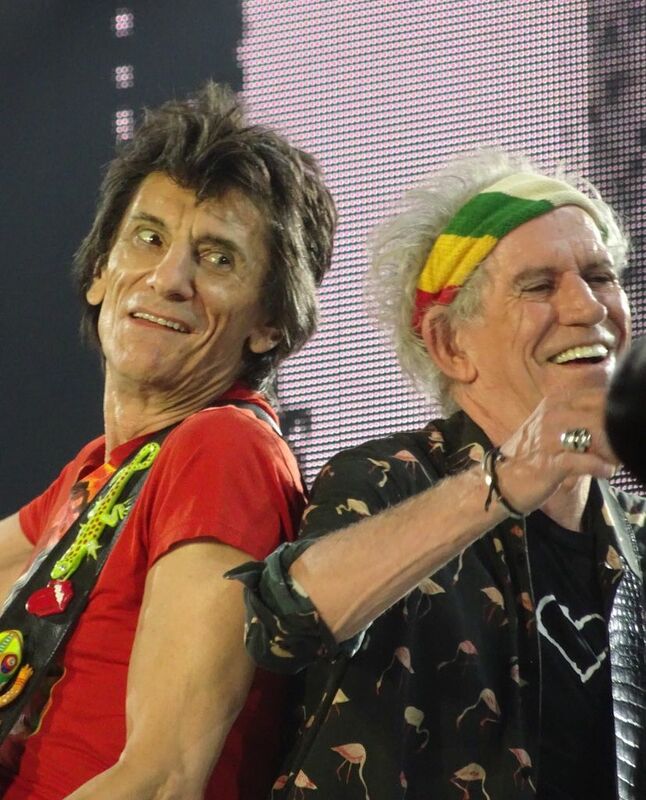 I did notice one magic moment, though, the "Midnight Rambler" breakdown: Keith rested his arm on Mick's shoulder, whispered something into his ear, and Mick laughed just as he was about to sing, "Weeell, you heard about the Boston ..."
That's not to say they were grumpy with each other. They just seemed to be in business mode, and there was also less banter - although Keith did remind us during the intros, "Let's not forget, Mick Jagger!" Indeed. 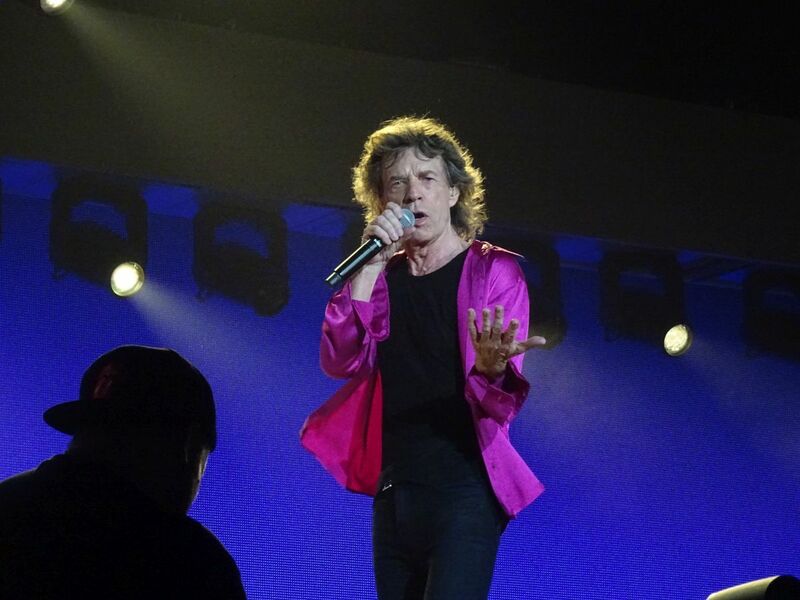 The show began with the return of "Sympathy for the Devil" to the opening slot, and I realized why it got the prime location on this tour: Mick loves the choreography. It's one big dance song for him, with a bunch of moves. He executed about four pirouette turns at the very beginning. "She's So Cold" and "She's a Rainbow" were rotated in tonight. It was obvious the latter would be the voters' choice because Mick strapped on his acoustic before announcing the winner. That makes "Emotional Rescue" the Hillary Clinton of the tour - a weak candidate crushed in every poll. The Stones could have offered a greater variety of choices. Contenders seemed to be drawn from about a dozen middling options. 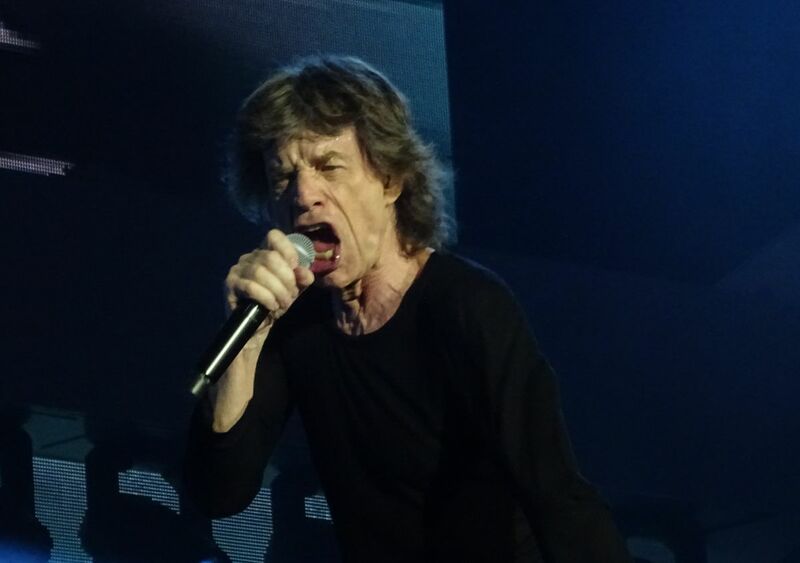 Mick did his usual roll call of cities, Toulouse, etc., And the loudest cheers came after he asked who was from Argentina. Keith, later on, thanked the blue-and-whites and their "Olé" chanting throughout the tour, and wondered what the hell they were all doing here. Sadly this did not translate into a mass "Olé" chorus during his set. This was when Keith told us that it was "our last show for a bit, not forever I'm sure." So that's promising, and a reminder to start saving hard. 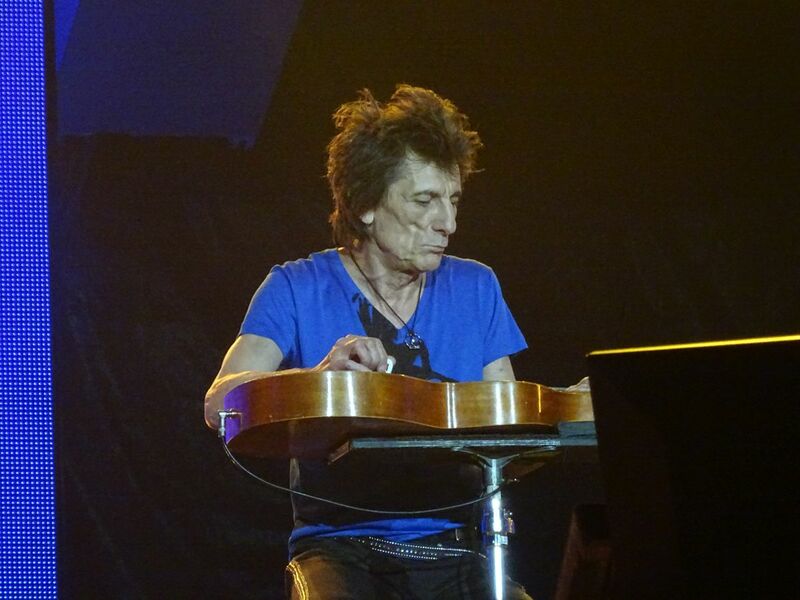 Tonight's show was the 45th in France, and hopefully the Stones will consider reducing their focus on Germans' wallets in order to play more shows around France. I took a bathroom break during "Miss You," so got to wander around the place a bit. I hate to say this, but people go nuts for that song. For a large swath of the crowd, predominantly women, it's possibly their musical highlight of the evening. Hard to see this ever being sidelined, although a streamlined version sans bass solo would be an effective compromise. I haven't written much about Charlie, the "Beaudelaire de la Batterie," but he was on his game tonight. His accompaniment to Mick's catwalk shuffle during "Midnight Rambler" would have mashed up well with "Theme from 'Shaft.'" Other times, I simply sensed that he was the most dominant performer on stage: Probably something to do with my bones vibrating as he pounded his kit. 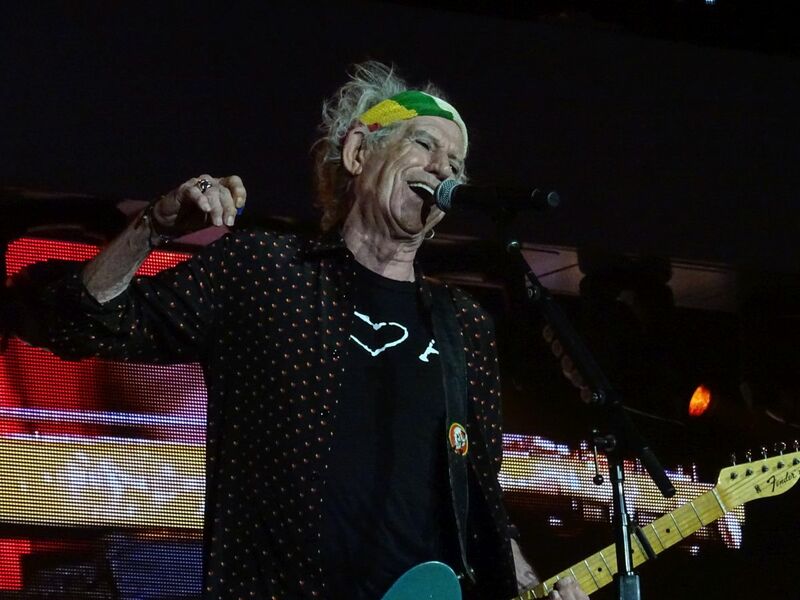 The final run included some dreadful Sasha wailing on "Gimme Shelter," although I usually tuned out on the song this tour because of the silly video montage of American protesters - which I guarantee Keith did not approve. It's a pity the Stones didn't spend time digging up vintage footage of European protesters with real grievances and do a montage customized to each stop. And soon enough it was all over, the Stones were gone, and the lights came on. I can't deny I felt a little relieved after being on the road for almost two months. But I also felt great pride in our boys for defying all laws of nature and common sense, and enduring gratitude that I got to witness their imperfect magnificence a few more times. Let it Rock.